Schools, Youth Groups, Birthday Parties, Functions, Events, and etc. I wanted to share some of my drum circle experiences with children of all ages to help other facilitators and teachers. My methods are not the only approach to this, but my hope is that some of it will help you, (and the kids.) Drum circles in schools work great, because it is a fun, experiential activity that promotes multi-cultural learning. It builds self confidence, and social abilities. It helps with motor skills, (processing information) boosts creativity; it even helps to teach them some basic mathematics. The drum rhythms are in time signatures, so math is taught without actually teaching it. It’s done in the process of just playing the drums, and having fun. Drumming teaches them more focused listening, concentration, and about reaching goals. Plus, it’s an activity parents can enjoy with their children at a later point. So a drum circle makes good sense. Kids like to write songs, and make up rhythms to play to. The teachers begin to see this occurring, then the light goes on and they want you to come back. For young children, a great way to teach rhythms is to use stuffed animals to represent sounds the drum can make. Or talk about wild animals representing the different sounds, such as: The Tiger (or kangaroo) – is a tone sound The Bear (or elephant) – is a base sound The Snake (or myna bird) – is a closed tone slap Rub your hand on the drum head to make sounds of wind, finger tap is rain drops and so on. Be creative. For public events, a colorful kid's drum circle sign of some kind is a good idea. Helping spread the love and healing of drumming is important to me, as it was a big part of my life and a major outlet for me, as I was a hyperactive child myself. Once I got into it, I went on to join the school band, learned to read music, and I've been a musician ever since. I've worked with various age groups of children both in schools, groups, community functions, birthday parties, and so on for about 30 years. Sometimes it’s all one age, sometimes mixed ages, sometimes with parents, or even transitional drum circles with the general public mixed in. From 8 - 13 years seems to be that perfect age, eager to learn the drum rhythms. Every situation with kids drum circles is different. If you’re looking to facilitate or teach kids drum circles, and you don't have a kit of drums yet, the idea of body percussion ie: hand clapping foot stomping etc. it does work – pretty much the same with boomwhacker musical tubes, Remo soundshapes, and things like that. I have some of both in my kit. For the most part, kids tend to get bored with it after a while. If it's there for them, kids like to play an actual drum, and that’s what I try and do with each child. Give them a real drum to play. They can play rhythms just like an adult, sometimes even better. They just need a little instruction on proper hand technique and volume so nobody gets a bruise or is too uncomfortable. Then we get right to drumming. If it feels like just having fun, rather than a class they learn faster. I use vocalizations to help them start rhythms out. For example, Yum Yum Tastes like chicken, (bass...bass...tone tone tone-tone) repeated out loud a few times, and then play it on the drum. We say it, and then we play it. Try cuckoo for cocco puffs... Use rhythms, commercial jingles, and so on. I tend to avoid drumming games and activities because my experience is they want to just jam on a drum and make some music. The next time I show up, they say things like we want to play Fanga or Beledi or some of the other more popular rhythms. I have Word docs of rhythms and various ways to notate, read, and start them on my website you can download free. Kids like learning these, and they like the challenge of making up their own rhythms. Kids can be playing the actual Native American heartbeat rhythm, African Fanga, Mid-east Beledi and Latin Clave, or hip hop in a matter of minutes like adults. These days an 8 year old can build a website, so playing a drum rhythm is just plain fun, and that's the idea. Make it fun. Make some music and not just noise. 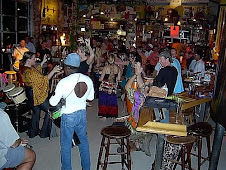 As for drum circle and chair set ups: If I can get in there early, I check for the best acoustic spot to set up. Look for the best place for the drum circle, where I can see everyone, and with the least amount of echo. I use my voice or clap loudly all around the room. Sometimes you are outdoors, or you get a small classroom, other times an auditorium. Every situation is different. And most of the time I have to figure things out like the best place to set up when I get there. Often times, the spot has already been selected for you, and you have to go with it whatever it is, wherever it is. A good idea is to check it out beforehand if you can, and suggest the best location. If it is inside, ask the staff if they can get those little exercise cushions so some of the kids can sit on the drums if they want to. It’s hard for some of them to hold the big ones up, let alone tilt a big Djembe. So lots of times I have the drums set out flat on the carpet so kids can try playing them both ways. Most kids like to try sitting upright, and down on the ground playing on the drum. I let them know they can try either way. I usually set up my chairs in a circle, or sometimes concentric - one a few feet outside the other. I leave a little leg room for the kids in the outer circle. Leave a few open pathways so kids can exit the area, or enter. I try to make the circle about 20 feet across. Any more than that, the kids can’t hear what’s being played on the other side, and you get a disconnect. You can end up with 2 completely different rhythms going on at the same time. Try not to clog the center too much with dancers either – a few at a time if they want to get in there. That can cause sound block and a rhythm disconnect also. I give them the tools (a drum or percussion item) and they figure it out for themselves and play. I let them know they can play when, and whatever they want to, and they can play whatever they want...but just follow the beat. Unless it’s a one time circle, later, maybe you can have them make their own drums, try a search on that. What we call junk percussion treasure, can be found in thrift stores and yard sales. Try a search on junk percussion also. 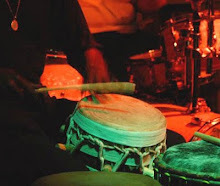 If you can get them on actual body drums like djembes, doumbeks, bongos, and congas, the idea of an ongoing drum circle or drumming program is a lot more exciting to them. They become musicians rather than kids in a class. The problem has always been drums are so expensive. Not so much anymore, most retailers will give a discount if you buy a dozen or so and build a kit up from there. As low as $30 - $60 each. Stick with synthetic head drums like Toca and Remo. You can round it out with tambourines, frame drums, and maracas. Try to avoid anything played with a stick - things get broken, especially if they have goatskin heads. Try music123.com - guitar center - musiciansfriend.com - sam ash etc. The arts or rec center in your area might help with a grant. Some schools are able to get them from drum manufacturers like Remo. Look into it and maybe get some help with the cost. My experience is getting real drums is what works. The drums made for kids cost about the same as ones for adults. I suggest getting 6 to 8 inch head size playable drums. Every situation is different. Sometimes I’m working with children either at a single grade level, with mixed ages, and with their parents on occasion. Often it is a one time outdoor event with mixed aged kids transitioning in and out of the circle as rhythms are going on. I had to learn to roll with it. If they want to put you in a huge auditorium and drum with the entire school, then you need to hire a few assistants, and you’re back to the hand clapping and foot stomping. Having 300 drums is just an impossibility for me so I try to talk them out of a huge "all at once" drumming event. I need to keep it under 100 at most. I’m one guy over here, and I just don’t do that kind of thing anymore. The kids seem to get less from it in large groups, as opposed to having each child play a drum in a smaller classroom or outdoors. Most of the kids drum circles I do are one time things, sometimes two, a week long, or a few times a year. Usually they are kids groups or organizations, in private schools or for special occasions, parties, etc. The kids really look forward to it because it’s a special event, and it’s just pain fun to bang a drum. I’ve done a few ongoing semester programs, but they are hard to get going, and usually the school already has a music program. You need to present them with a course curriculum, and the kids don’t seem to benefit as much. Selling the idea to the school is very difficult as opposed to a one day or half day drumming event. I find that the kids actually become more interested and intrigued by hand drumming if it’s a one day or sometimes a one week program. With private or public schools it’s important to know the schools code of conduct, and I adjust the drum circle accordingly. Sometimes I teach little family home schooling drum circles. Where it’s one on one, or one on two drumming lessons, I like to include the parents in the drumming if I can. They are usually just sitting there watching, so I try to include them in the drumming as well. It’s better for their relationship with their children anyway. Working with mixed age groups of children is obviously a little more challenging. And, if outdoors, even more so. When working with only one child, you have to be able to keep their interest for an entire hour. Younger kids have shorter attention spans, and you need a bunch of ideas ready to go with. There are quite a few drumming ideas, and games here. As a general rule, when I work with particularly younger age groups, I will structure my program to suit them, and the goals of the educators, or parents. I usually talk with, or email them beforehand, and we discuss it. I ask what their particular vision of the drumming might be, and what they would like to achieve from it. We figure out the program, and tailor one that’s right for them. Take it one step at a time. Getting a foot in the door by doing a benefit “Teach In” at smaller schools can do wonders for you. Drum circles usually only get press if it’s something negative, and most of the time I am pitching the idea to someone who has never seen one before. So I have to overcome that and explain the drums are expensive. That they don’t just magically appear, and years of work, and musical training goes into this. I charge by the event, and not the hour. A 1 hour drum circle takes me 4 hours to pull off by the time I figure in the loading, unloading, travel, setup and etc. So if it’s two 45 minute drum circles, 2 hours, however it goes, I charge by the event. Most of the schools and youth groups that benefit from this the most have very limited recreational budgets. So if I can get $100 or $200 for the day, I’m doing pretty well. This kind of work pays in the heart, more than it does in the wallet. You’re doing something that may inspire these kids to make playing music a part of their lives like it did for me. It is a life changing thing you are offering. So that hundred bucks may not seem like much after a full day’s work, but you put something good out in the world. At the end of the day when I sit and reflect how things went, that’s when it sinks in. You remember the smiles on the kid’s faces, how much fun they had, inspiring them, and how great they sounded. Back to the client pitch. Some of the questions that I ask beforehand include the following. Are there are any issues I should be aware of? What is their policy on any extremely disruptive behavior, etc. Unfortunately you don’t always have that luxury when you work with a group, but I try to get as much information as I can. Even beforehand, I research the particular school, club, youth group, or whatever it might happen to be. I speak to the administrators, look up their website, examine their mission statement, and try to have a good understanding of who they are, and what they are about. It just makes good sense to do your homework before you go in there to facilitate a drum circle for a children’s group. Kids are very impressionable, and I feel you are a role model for them. Whether you think so, or not. Children see any adult in authority as a potential role model. In a relatively short time, kids can understand how music is being made, and they are making it themselves. Perhaps a few will like it so much they will look harder at the school music programs where they now understand they can express themselves creatively, and possibly even join one. Maybe some will join the school marching band. I did, and it was fun. That was the only place in school where I fit in, and wasn’t the outsider. I wasn’t one of the cool kids, the pretty kids, the jocks, you get the idea. You can make a big difference in somebody’s life – that’s the real point here. They might go on to have a great musical career. Even if not, they will have a safe place they can go to heal themselves when they are hurting. They can also play their drum as an outlet for frustration, peer pressures, stress, hyperactivity, or even just for fun. If it’s a music program, a small group, or a school class situation, or just a mixed age’s event, each one has a slightly different approach that I use. Whenever it’s possible I try to speak to the parents or teachers in advance and ask for some advice. They are a big help if you can get it from them. As a general rule, at the start of a drum circle or drumming program, I like to get them tired out a little bit first. I get them up and moving or dancing with those small egg shakers, as I play a dancing rhythm on my Djembe. Then we get to the drumming, after a warm up rhythm, I mix in a quick lesson here and there. The history of where the instruments are from, and some lessons about hand technique. 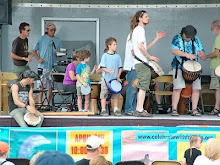 So a children’s drum circle needs to be tailored a little bit to the specific needs of the age group, or mixed ages. You can try some of the ideas below with different age ranges or with mixed ages. Some of them are mine, some are ideas I learned from other teachers, and facilitators whom I’ve seen work with children a lot. More often than not, if it’s ok with the staff, I begin drumming, as my group comes in and wordlessly gesture to them to join in with the shakers. I don't speak till they all have started to play. This may work, or it can lead to a stand-off. It depends on the group, and the situation. Usually it’s a smooth move and transition, the kids just join right in and play what they feel. It sets the right kind of tone for the session. Hey, this is going to be fun! Sometimes the teachers want everyone to be seated first before playing, and say some things. If that’s the case, then I let them do that, and get to the drumming as quick as I can. Since every situation is different, I never really know how I am going to start. My preference is me playing as they enter, and gesture to them to join me. As a general rule, as I mention in more detail below, I want to get the kids up on their feet and moving around in the circle to tire them out a little bit first thing. Then they are a lot easier to work with. I use the little egg shakers, one or two for each kid. I pre-set them on the chairs, and when they enter the room I start playing a funky beat on my Djembe, and ask them to play the shakers with me and dance in the center. Obviously, this needs to be discussed with the teacher first, so see if they approve of starting this way. For the second time I work with them, I use small tambourines instead of the egg shakers. Lesson One: Warm up drum jam. Then, introduce the idea how to make homemade drum and percussion instruments. Including a brief discussion of music theory. What determines pitch, volume, tone, and resonance. Followed by a brief drum circle finale to experiment with the drums, and percussion sounds. Lesson Two: Learning rhythms from around the world. A brief sample of rhythms from different countries and regions. What instruments are used in these cultures? Followed by a brief drum circle, where we try a few cultural drum rhythms out. (As part 2 of the prior session.) And how do the homemade instruments compare to the drums and percussion instruments from around the world? The tone, shape, sound, purpose, and appearance, etc. Lesson Three: Playing various drum rhythms as a group. Including some basic drum circle activities, more lessons on music theory, and some drum circle fun. (As part 3 of the series, applying knowledge from both sessions 1 and 2.) The emphasis is on group listening, group song creation, and the building of a group dynamic. My approach with this kind of thing is slightly different. I like to educate the kids about playing goat skin wooden body drums. I always begin with the drums away from the center of the circle, far enough in so that they can not be played as they take their seats in the circle. I start with the egg shakers, and let them think about how they will soon be playing all those cool looking drums over there, and wondering what they might sound like. Then I begin to introduce the drums as my friends, and encourage a conversation about how we treat our friends, and how we like to be treated. I ask them to treat my drums that way please. Occasionally, I am called upon to do a one time series of short drum circles for multiple groups of kids at a school or with a group. Often they come in one class right after another without a chance to even take a breath. I use the following, slightly different approach for that. When the kids come into the room, I will be playing my drum and have a shaker or drum placed out on each chair, or in front of it. I gesture/ask them to dance, or play the shakers along with me as a warm up and also to give them something to do immediately. When all of them are there, I move on to the following. 5 minutes – Warm up and build rapport. We start off with a body warm up, doing arm stretches, etc. I act a little silly to get them to laugh, setting the mood for fun. This puts us all in the right frame of mind and starts to build my relationship with them. I introduce the drums, which are over to the side, again, as my friends. I talk about how we treat our friends. This is so very important. If I lose a drum, It’s the equivalent to a day’s pay. I have no percussion items that are played with a stick, because it usually finds it’s way to a goatskin drum head. Bye bye $60. Back to the fun. Five minutes – Drum, and dance. I play an African rhythm on my djembe. Depending on the number of kids in each age group, and how much room we have, the rhythm also includes some movements and dance. Each child plays a shaker and dances while I drum. This activity tires them out a little bit more, so that they are more in the mood to learn. Plus, it is great fun. An alternate is doing an activity I call funky musical chairs. Five minutes – Sound shapes and/or boom whackers. I use these simple percussion instruments to teach some basic music theory playing on the downbeat, in a 4/4 time, using these instruments. In the process, I demonstrate how mathematics applies to music theory. Then a short call and response, then maybe a call and echo rhythm game. With vocals or percussion instruments. 5 minutes – The introduction to the drums, with some brief history of djembe, doumbek, and other drums. I demonstrate the physics of playing a drum. How it is shaped like a rocket engine. We apply the “energy” with our hands and the sound is the rocket fuel. Each child selects a drum, and I teach them how to play the bass and tone notes. 20 minutes – Group drumming on the djembes and doumbeks. We play a few basic rhythms from each culture and have some fun drumming. End with a big rumble finish. That’s it. Take a breath, Next group. Before, or afterwards, try suggesting to the teachers to have the kids read books and journals about musicians, and about different music genres. Even suggest that they talk to musicians whenever they can. For the most part, most musicians are very accessible and willing to help by answering questions about our craft, to help them grow musically. Always try to be on the look out for these opportunities to chat a little and learn something from a professional. Suggest to the kids that they have their parents take them to live music performances if possible. Attend a clinic, go to a concert, stage play, or a music class. Or bring Djembe Dad to school week. And to listen more closely to the beats of their favorite music in their iPods or mp3 players. One of my favorite mixed aged kids circle was a birthday party in a park, when a friend of mine's very young daughter danced her way to the center and started to facilitate the drum circle. She grabbed a rattle and rattled at just about every drummer there. Any they all responded to her musically. Then she started dancing. She was a natural facilitator. Lots of kids have never played a percussion instrument before, so some of them are very timed, scared, and even self conscious. Some others can‘t wait to get to it. (Not as much as with the teens though.) Don’t expect to get miracles on the first session with kids. Sometimes it may take them two or more drum circles to loosen them up enough, and become comfortable with you. The second session is when the most magical things usually begin to happen. All of a sudden you may find yourself and the entire group living totally in the moment, all in unity, and even sounding pretty good. This happens with dancers dancing, also. That’s one of the reasons why teenagers, and young adults get so hooked on raves, (parties) They dance and dance for hours and all of a sudden it’s morning, and the sun is rising. And to them it feels like it’s just been a few hours. Like the golden ratio exists in music, it also exists in dance and singing. Unfortunately, at most of these rave parties there is underage drinking and/or some drugs involved. Believe it or not, some kids can be good facilitators. Many are naturals at it, and love to get to be in the center alone for a few minutes. Almost all age levels of kids seem to like giving it a try. I'm always amazed at what they do in some drum circles. I offer to let them do it all the time. Almost every time it works perfectly. (Almost.) With mixed ages of children, it is considerably more challenging. I try not to show so many things at once. I don’t want learning about drums to get in the way of just learning to drum. I need to try really hard, not to try too hard, or over think it too much. It’s supposed to be fun. Let the kids have a little fun along with you. I usually tell them, “Just have fun and play what you feel like playing to the beat with me. Just follow the beat.” When you think about how to drum too much, it takes the pure joy out of the drumming. And as odd as it may sound, don’t forget to breathe, or remind them to breathe. Many musicians and teachers will tell you that. Take a deep breath now and then as you play, and remind the others to do the same thing, take it all in, and enjoy the experience. Hula hoops are your friend at kids drum circles. I bring 3 to 6 of them, sometime I use them, sometime not. It depends on the general vibe. Kids can hoop to the beat inside & outside the circle. It connects to the music, and vice-versa. I’ve found that certain ages are much easier to work with. Myself, and most facilitators I’ve spoken with, like working with the 8 to 13 year old age range kids, because they are like these little sponges wanting to soak up all these new fun things. They are also somewhat more used to having respect for authority, or what an adult has to say. Anyway, the 10 year olds tend to raise their hands to ask questions, and they are much more orderly, making it easier for you to work with them. They can just pick up fun rhythms very quickly, if you vocalize them first. Things certainly have changed over the years in the schools. (Me being 50+ years old now) Early on at the beginning of one year, I saw a teacher in 6th grade put an extremely disruptive student up against the wall, get in his face and read him the riot act. Well, as a result we all behaved really well in his class for the rest of the year. I sure didn’t want to get embarrassed like that in front of all my friends. That’s all changed now of course, that particular teacher would probably loose his job, and never teach again. Nowadays we have kids bringing weapons to school. That never used to happen because I think kids had more respect for authority. I wasn’t going to mess with some of those teachers... I was just plain afraid of a few of them. I started playing music as a child, and went on to join the school band. Whatever a child may decide to do with their lives as they grow up, I think music helps them a lot in many aspects of their life. Lots of the kids I have worked with have done exactly that, joined the band. So I feel like I am introducing something really positive into their lives. Maybe I inspired them to be a musician, as a hobby or even a career. You never know how deeply you may affect some of these kids. They get an outlet, if nothing else. So to try and sum up a bit, if I feel I need to, or the teachers desire it, I mix in some drumming games, and activities with kids. Whatever the age group is, I adjust my program accordingly. Mostly, If it’s up to me, I just want them to drum, and create music as a group. But I still spend a little extra time, to just give them a few pointers on how to drum without hurting themselves, and then just start out rhythms and let them play. I let it go wherever it goes for 5 minutes or so, bring it to an end, and then start up another one. (Or, offer to let them start one.) I want to educate them a little, but also I need to pace myself. So that’s why I mix in a little about the history of drumming, and the different styles of drums every 10 minutes or so. Then I can keep the ideas flowing in my head. I keep the drumming sets a little shorter, unlike with the adults. Kids are very perceptive, they can tell if you are unsure of yourself, or don’t have a lot of confidence. They can see right through you. I try to treat kids as I would adults. I talk to them like they are adults, and I immediately gain their respect faster. It makes the job a whole lot easier. You are all a bunch of cool dudes, & we are jammin’ in the band. Sometimes If I feel they (or I) need a break, or I need to do a big change in the group dynamic, what I suggest is a five minute break and when they come back, they sit in the chair across from them and play whatever drum is there. Or, I will have them pass their drum carefully to the person on their right periodically between rhythms. It works. With the ok from the teachers, you can get a sort of Simon Says thing going later, or funky musical chairs thing going if you want. But, right away, they see that the ones who lost their seat get to play the drums quicker, while the other kids still parade around. They figure this one out really fast. I get into that, and a few more ideas to use with kids in more detail in a moment. A lot of these drumming games and activities are ones I thought up. At least they were created in my head, but most likely many of them exist in the collective consciousness of most educators, and drum circle facilitators. (What idea really is original?). We all see ideas, and get pointers from others to try out for ourselves. Many of these ideas and games have probably been also thought of and tried by others, and passed along to help us all to be better facilitators, and ultimately do a better job helping people to enjoy drumming. So I believe in the sharing of ideas, I think we should all share them, and not hold onto them secretly, as some people do. Feel free to try any of them, or pass them on to your friends. I have no problem if somebody comes to watch me and see what I’m doing. It happens all the time. There's a few facilitators, that rather than just asking me, which I would happily do for them, they send their spies to come watch me work. Whatever, I don’t care. Good, I hope you learn something you can use to help kids to enjoy drumming more. Drumming should be about sharing. I still show them everything I do, and don’t hold any ideas back just because I happen to see them out there watching. The kids are more important than those that may feel like they are the competition. I'd rather work with them, or at least have a cordial working relationship. Be supportive, share leeds et. There's plenty for all. I find that it is best to have a good standard operating procedure, or prepared program. Like my mixed ages adult set list. Even though things will likely change in the moment, at least I have a good road map in my head. Also, the transition points are much faster, and almost continuous. No matter what age the kids are, or what kind of group it is I’m working with, I have to keep my wits about me, and my head in the game. I usually position myself at the drum circle where I can see the entrance, so I know what’s coming my way. A curve or an unexpected surprise can come at you at any moment, and you need to be able to adjust to it if necessary, and go with it. Whatever it might be, a few extra few people wandering in, some joining in late, or whatever might happen, you can be ready for it at the spur of the moment, if you are prepared mentally to transition them in seamlessly. If the rhythm transitions or changes, I suggest rolling with it, especially at one time drumming events. So what I am doing is thinking about the now, the “in the moment” most of the time. But I’m constantly reassessing the group dynamic in case I need to make any adjustments. Is it getting too loud? Too sloppy? Is it time to slow things down? Does anyone need any assistance? Are they bored, tired? Need the bathroom? If you are experienced, and in the moment, you can feel what adjustments need to happen, and make them accordingly right away. I think kind of like when you are in a chess game. With children, I try to think just a few moves ahead. Like five minutes or so, ahead. But most of that is from information I am gathering from back when I was in the moment. I have to snap out for a few seconds to plan the next rhythm to play. What does the group feel like they want to do next? Where are we headed? The thing I had in mind a moment ago, might not feel right at this point. So I need to change it up, and improvise away from the set list, or program. Just like you don’t want to hear the same song over and over, you need to sense what is the next thing is to do. When is the right time to end the rhythm, how am I going to end it? I don’t want to use a rumble for every single one, so I use a number of different endings. When we stop, should we chat a little, so they can rest? Are there any announcements that need to be made by the staff? This is a good way to give your hands a rest also. Shake your hands and then rest them. Or do we just launch into another rhythm, or is it time for a rhythmic game? This kind of thought process helps me to live in the moment more comfortably, and transition points that happen are much smoother for me. I keep the plan moving in my head, adjusting it all the time to the group feeling, and the vibe. It takes a little experience to be able to do it. After four or five times, you will have it down. Also I need to keep in mind the overall picture of the program, however it was designed for the group. I need to watch the clock, for example for break time. I don’t like to have to be aware of the clock unless I have to be. Where will the group be in 15 minutes? Where will they be in a half hour? Do I have another group coming in right after this one? I may need to allow some time for any primary activities that may have been planned by the staff. I may have to cut things short, if a few rhythms run too long. (Which often happens if it’s going good.) And I need to allow time for a good ending, and leave a few minutes for the kids to ask a few questions, and answers at the end. Most of them are eager to learn about the drums, and percussion. You can sort of map out, or outline your session, and weave it into the set list. If I’m working more than one hour, I plan it one hour at a time, so my head isn’t overburdened with so much information in it that I might forget something important. It’s a good idea, because you can’t always remember everything all the time. I sometimes forget key elements, like the basics. Where do some of these drums come from? What are they called? How is the sound made? It’s easy to forget. It’s blunder time. For example, after one drum circle the teacher from the older classes asked me to explain where each type of drum originated because they had just studied the world map, and they were very curious about the world now. I felt like a dope because I forgot to mention it that time. This is also why having a feedback, or survey form, to give the teacher is so useful after a drum circle. You can get some perspective and critique on what you can improve on, and what went well about the drum circle. What did they like the most? What didn't work? How did they feel after? Etc. I remind them of their beating hearts, the way they walk, and that in all of nature there is rhythm, even the city sounds have rhythm, and everyone has rhythm in their bodies. And I try to get them all playing as quickly as possible. You can mix in the history, theory, or physics lessons between the rhythms like I do if it’s called for. Most of the time kids are fascinated by both. Especially when I talk about how a djembe is shaped like a rocket engine. This seems to fascinate children of all ages, and using a djembe to explain to them the basic physics behind how sound works, and is created. It is also a great way to demonstrate a little hand drumming technique. After all, a djembe is shaped like a space rocket engine. I usually bring a big picture of a NASA rocket taking off to better illustrate this at some point during a lesson. I’m using visual communication. Where is the sound of my drum coming from? You can demonstrate how the djembe sounds when the bottom of it is held flat on the ground, and then again with the drum tipped towards the children. That’s a big “ah ha” moment for them. They can hear, and feel the change in the pitch of the notes this way. I explain how the energy from my arm and hand is being transferred to the drum head, creating that sound fuel. That is the rocket fuel. I show them an 8 x 10” photo of a rocket ship taking off, and the shape of the exhaust cone, with the fuel coming out of the bottom. “See how similar it is to the bottom part of this djembe drum?” It compresses the energy before letting it out, making it more efficient, and louder. You are providing the fuel for it to “take off”. One good idea, is to try walking around with the drum held in your arm sideways, with one hand doing a bass note over and over, near each kid. Get them to hold up their hands, palms out, and feel the percussion waves coming out from the bottom of the djembe as you walk past them, with the drum up, demonstrating it for them. They love the idea that they can feel the whoosh of sound waves, as well as hear it. The teachers always love this bit. After all, I get to tell the kids they can do something they rarely ever get to do. Make lots of noise. And I get to be a kid again for a little while to. I’ve noticed that when I have the kids start out a rhythm on their own, it usually falls into kind of a default pattern: 1-2 pause 1-2-3. I call it the default rhythm. Bass--- Bass---tone-tone-tone (Try saying anything that fits to it: “I like Choc-Late-Cake”.) It usually turns into a nice jam, and kids of all ages can pick it up quickly. Or then fall into a Conga line rhythm. Or, start it out for them. A Conga line is also a fun activity while playing. Get them parading around the room with shakers, as you play a rhythm. Just clear it with the teacher first. "Pass the popcorn, Please" is a fun idea. Dum - ba dum dum - - Dum! Don't expect to play a rhythm for more than four, or five minutes. The volume and down cues are always good to teach right away. Rumbles are life savers. Sometimes, I start with one at the beginning of the program. I really find that what I say in the very beginning is the most important thing. First impressions are so important with kids. Got to set the right tone. Just like with adults, I often begin a rhythm to words, or with some sort of vocal association to it, to make it easier for the kids to quickly grasp onto the beat in the music. Or a variation with an extra beat is, " Look, a great big barking dog." Which is similar sounding to Samba. Again, “Look” is the bass note, the rest are all tones. Another great drumming rhythm is the old standard, "I got rhythm, yeah" ---"DA DA DUDUM, YEAH". You can show a few tips on how to play the drum. Try out things like the drum wave. You get it going around in a circle and each kid taps their drum one time, then speed it up, reverse it, etc. It’s a controlled game without a lot of chaos that gets the kids familiar with their drum and it’s a good ice breaker. Later you can introduce percussion. Those sound shapes are handy to make up rhythms with. I don’t use this one very much. I like to tire them out drumming, and get them playing rhythms right away, rather than playing drumming games. The kids seem to respond to it better. A good learning game you can try, is to bring a ball, like a soccer ball, and ask the kids to play one drum beat when I bounce the ball. You can bounce it fast, slow, low, high. Then let one of the kids try it out. This might work better with the older ones. A better variation is to toss the ball in the air and have them do a rumble, or drum roll, and it stops when you catch it. So you can bounce for a single beat, and toss in the air for a drum roll. You can add walking so foot steps become drum tones, or maybe another percussion sound. I use this game sparingly with children and adults. It’s lots of fun and almost always works for a few laughs at least. With younger kids, I really don't expect too much in terms of real drumming grooves, but often it does happen. I let them bang around and have fun making some noise. They hardly ever get permission to do that. Rumbles and stops are a good thing to make into a game with them. Getting them to start and stop playing together is a lot of fun. I keep the beats very basic, and simple. One facilitator I know sets up a drum “petting zoo” in the corner for the little kids while the big kids drum circle is happening on the other side. A very clever idea. The little kids can come over to the area, pet and play the drums like they are furry little animals. Just make sure someone is there to keep an eye on things. If you have more kids than drums, make two groups and bring some large paper pads. Have the one group play, and the other one paint the music. Brushes or fingerpaints, then have the kids switch sides after 15 minutes. Better clear this one with the staff first! Here’s a cool idea. I try the Simon Says game with drums, “Do you know the game Simon says?” Kids can only play when they hear the command "Simon says". If you give a command without saying "Simon says" and somebody does what you say, then they are out. "Simon says rumble - RUMBLE, Simon says "stop" - STOP." If you give a command without saying "Simon says", then you can make a big deal out of it and make all the kids laugh. With younger age groups, I wouldn't recommend taking kids out of the game. We want everyone to win. With little kids, I don't worry about the music as much. I have them work with sound dynamics like loud and soft, and start and stop. Try including a song with the kids. Let them make a song, or tell them a story first, and have them add in the sounds of the instruments to it. Like walking through the forest to the castle, and have them add the animal sounds with their voice, or their drums, and then do it. This one works great. Another idea with the older kids is you can try playing, "funky drumming musical chairs". That’s a little more cool. Set up two rows of chairs back to back. Start with enough chairs for everybody the first time. Have the kids sit in the chairs while you explain the rules. They all walk around the chairs in the same direction shaking egg shakers, and there's no running (safety). You play a funky rhythm on a drum, and when you stop playing, the kids have to find their seats. Each time you take away a chair, so there will always be one kid who gets caught out. Whoever gets caught out, gets to loose the shaker if they want, and pick a drum or other instrument, and comes over to join the band, that's you. A teacher with you on this is a good idea! When you take away the chair each time, have another adult bring the chair over and place it next to you. As more chairs come, one by one, have them arranged to form a new circle, drums in front of the chairs. This way you are building your drum circle one child at a time. Eventually you will come down to just two kids circling one chair, with the rest of the kids playing instruments around them. One child gets declared the winner, and everyone joins up to play together in the circle. In my experience, I often get a lot of kids who try to lose on purpose so that they can come and play on the drums. I have witnessed some examples of hilarious politeness, where kids offer to give the last remaining chair to another kid so that they can come and play in the band. You can expect a little bit more musicality from the older kids. They will like call and response a lot. Once they get the idea, I often will turn it over to them to make the call, and then I encourage the group to make the response. Pass it around. Another activity I learned from another music teacher that works with the slightly older kids is the sound snake. Once you have them in the circle with an instrument each, you get in the middle and tell them that when you point to them they should play one note (hit) on their instruments. You spin around the circle with your arm extended like the hand of a clock, and when you point to them they should play. Start slowly at first and once you have gone around a couple times, and they get it, then add the next element. The change. This time as you go around at some point you say, "change" and start to go around the opposite way. This will keep them alert and focused on watching you. This often turns into a nice little jam, or it falls flat completely. I recommend having lots of adult supervision. If you can get them involved, then you can really do something. If you have someone to play the bass drum it will really help if you want to get more musical. The kids love it when I combine jumping, with stomping. We play games where they try to anticipate when I am going to stomp on the floor and try to hit their drums, at that instant. This gets them to understand the importance of paying attention, near the beginning of the session. Start a rhythm with hopping, then turn it into stomping, and maintain a relatively steady stomp for a bit then break sequence. The game has begun! Kids love to be fooled, challenged, and surprised. You can even try letting individual kids into the circle to facilitate their own hops, jumps, and stomps. I keep this idea brief. Sometimes I get a hip hop rhythm going on my djembe, and see if any of the kids want to do a little “Rap" song to get them going in a fun different direction. Or ask them if they would like to tell a story to the beat. Just lay a nice soft support beat in there, (starting it slowly) and away it goes. But I always make it a point to explain to the kids that when we have a singer, that we have to support them, by listening to them, and backing them up. We are the back up band, the rhythm section! So we can’t play too loudly, or we can’t hear the lead singer, the rapper rapping. This also teaches them to listen closer. It’s nice if you can have some help, or an assistant. They can help you to settle the kids in, getting in on the bottom drum if necessary, or supporting the beat or rhythms with you. Keep an eye out for someone who can keep time, even a teacher. With the younger groups I find this very helpful. Having an extra person to hold the beat with a bottom drum. Unfortunately for me, I work alone, and don’t have that luxury. The older students, (like 4th grade and up) I can easily volunteer one of the students with solid rhythm, which I try to evaluate during the warm up jam. I sometimes set up in small sections of instruments around the circle. This makes a more organized way of students switching to different instruments. "Everyone stand and move three chairs to your right". Or “Cross to the other side”, etc. This way there is not a lot of rush moving throughout the circle, and everyone has an opportunity to play a different instrument. Pass it to the right one person works also, to save a little time. Sometimes you only have 45 minutes to work with them in a class situation and just can’t do some of these activities unless it’s an ongoing thing. Just remember to leave a few pathways so kids can move in and out or around the circle. This idea ends up being a little awkward for me sometimes. I start a groove out, then after a couple minutes I tell the group we’re all going to pass our instruments around the circle to the right, but we are going to do it while trying to keeping the rhythm going. I count 1... 2... 1, 2, 3 (repeat) and then pass, then we all play. Then repeat it again after a while. Possibly take it around the whole circle. Allow enough time so that each person should have their new instrument, and they are ready to play it. I sometimes pre-set different instruments like shakers and boomwhacker musical tubes under the chairs before we start (a good tip I learned). By doing this, the group is able to progress from one rhythm activity to another to another more fluidly. I start with the shakers and do the shaker thing activity, then right to the drumming, or, progress to boom whackers, then on to the bigger drums. I find this helps the understanding of drumming rhythms on drums faster, and gives you an opportunity to begin teaching without teaching. Sometimes I am in a more chaotic environment and don’t want to start out with the drums. It takes place step by step, and adds the structure needed for working with larger groups. It also lets a kid know they can stop drumming and play the percussion instrument it they want, or switch back and forth. Here is a simple game I learned from another facilitator. Ok, two rules to this one. If I put my hands in the air you can play as fast and as loud as you like, when my hands come down, you need to stop. Then shout one two three Play! (but don't put your hands up) and see how long it takes them to get it. Then just have fun with it, the kids in every group start laughing, or go wild and love it. 15 - 20 minutes disappears like nothing. Then I try non verbal communication. I point to my hand and put it up as if I am about to strike the drum head, then I point to my foot and lift it in the air, then gradually by dropping my hand and foot at the same time, I get them to figure that they hit the drum when I put my foot down...then I can start to walk....a little faster....a little faster....now I am running and the rumble is rising! Now I am twirling and spinning and the drums are crazy and I jump in the air, do an exaggerated big stop and funny face. They seem to just love it they are together, starting and stopping. I bang out a few beats of a rhythm; they play it back to me. I call, they respond, & off we go into a nice jam. We have hardly even verbally spoken. But musically, we have already become friends. Everyone is smiling, the staff thinks I am pretty nutty. I sometimes will use puppetry and drumming with the younger kids, along with every other hair brained, nutty idea I can come up with that would be fun and that will make the kids laugh. One idea is to create stories using sock puppets, or their favorite stuffed toy. I create drum rhythms that would be played when the name of their toy is called out. The kids were completely involved in the process and it was a great way for kids to work with them as a team. With the 8 to 13 year age group I often use cheerleading rhymes and skipping rhymes to spice up the drum class. Cheerleading rhythms are great because they’re fun and funky, and you can usually create great beats with them. They can also be tailored to the school the kids are from. Nothing like supporting that school spirit. Use the school’s song, the staff loves it. Sometimes I go with the pie slice configuration thing for placement of the drums, and various other percussion items. It depends on the situation if I do this or not. I set up the instruments, and as the children arrive they take their places by the instruments. This can work really smooth. I request the oldest class arrive about 5 minutes before the others, and like clockwork, we were cooking along already by the time the other classes started arriving. I just need to make sure the bottom beat is very stable. If I am working with different grade classes at once, I sometimes assign instruments basically by their grade class: 4th & 5th graders get drums, 3rd graders get boom whackers, 2nd graders get frog wood blocks and guiros, 1st graders get shakers, and the kindergarteners got jingle bells and maracas. I was a little concerned that the younger ones might get bored with no drums in their section but that was not the case when I tried it. If you want to try sculpting, carve the group up into the pie slices thing while they are playing, or whatever. I’ve done a fair amount of it, I’m not a big fan of that approach, but the kindergarteners got a huge kick out of being showcased when I’ve used it with them. The wave activity thing is always is a little lame, but it’s something to try, and it works. I learned that whenever I get lost, confused, or when I’m in doubt, I rumble. Little stumbles and train wrecks disappear. I introduce the drums, some basic technique, and use the windows of communication sparingly. I want to get them to play the drums, not play drumming games. But some of these help you to keep them interesting, or to get them on track. It’s mostly just to draw their attention to the wonderful and diverse musical community we live in. Try some of these drumming games, try to making some up. See if the kids have any cool ideas. Teach and sing a song together, then drum to it; do the simplest of set rhythms “Hot chocolate hot chocolate nutella on toast” and, as soon as they've got it, ask them if they want to make up their own sayings. When you sense the kids want to learn, try not to rush them at it. Because every minute spent in a drum circle helps every drummer from beginner to expert become a better drummer, and to be able to learn faster. One of the most important things I learned from my very first experience with elementary and middle school kids, was to let them get their excess energy expended at the beginning of a session. Let them get it all out, the stress, the nerves, that peer pressure, or whatever. I remember how it felt to feel different than the rest of the kids. Right off the bat, I either get that egg shaker dance thing going, or I get them on the drums and play a danceable rhythm on my drum and let them rock and roll about five minutes to warm up. I love to hear them start exclaiming that they're tired, all huffing and puffing. Now our drum circle can really begin! For the littler kids, I usually use frame, buffalo drums, or sound shapes with mallets since their coordination isn't as fully developed at that age, and their attention span is rather short, so it’s a bit of a challenge for them to learn hand patterns and complex rhythms. I usually play my djembe as the bottom beat to it. If you do go with hand drums, be sure to make the rhythms and movements very simple, and clear. Start them out very slowly until everyone has it solid. I prefer to use these two sayings the most for vocalizing 6/8 time signature rhythms: “Follow the yellow brick road.” Or, “Cab Bage And Broc O Li”. I find that most kids generally do love to sing and naturally sort of play on beat with whatever instrument they have, except when they get carried away into a frenzy. Which becomes a convenient transitioning point to something else. Listen to the clock: tick-tock, tick-tock. Hey, diddle-diddle, the cat and the fiddle, The cow jumped over the moon. Row row row your boat...gently down the stream. Jack Sprat...could eat no fat! Make up a few, try reading sentences aloud from their favorite books, or phrases from their favorite songs, and rhymes. Try playing Names, Food, Objects, Commercial Jingles, and Phrases Playing kid’s full names and kid friendly phrases can be interpreted into a series of long and short notes. Try adding simple drumming to rhymes. If you're happy and you know it, bang a drum, or shake an egg, etc. Once the kids have mastered playing along to a nursery rhyme or any common saying you’ve got them. And then you can get to some real drumming. Here is a fun drumming ending rhythm idea for a session, The I got to go rhythm. It has a natural rhythm to drum to. Accents are on the “G“ obviously: I...got to Go - got to Go __ gotta gotta - gotta Go and repeat. I try to use anything I can think of that gets them to laugh and have fun. Balloons, blowing soap bubbles in the circle is fun, (if the teacher approves) I often bring along a couple of soap bubble bottles with the bubble blowers inside them. Try combining a variety of percussive sounds to create lively rhythms. Maybe start a call and response dialog between the different sounds, a back-and-forth, and back-and-forth approach. Ask them to think of it as drumming conversations that repeat over and over. It’s okay if they change it. Try this idea, have them drum syllables to these, or some similar phrase: How are you? (1,2,3) They answer, I am fine. (1,2,3) Or, try it with three notes from you, then four from them. And repeat, etc. Once they are comfortable you can up tempo it to a groove. It’s important to help kids to learn to differentiate between high and low pitches, so you can demonstrate the sounds on their instrument. You will obtain a low pitch by striking the center of the drum head, and a higher pitch when striking the edge. The large sized drum has the lowest pitch, the middle sized drum has the medium pitch, and the small sized drum has the highest pitch. Use your hand to demonstrate the different places on the drum you get the different sounds from. After a few minute demonstrations, ask them to give you a thumbs up or thumbs down to identify the note as high, medium, or a lower note. Once they're comfortable with identifying high or low notes, you can ask them to play a high or low note on request. Try the Morse Code Jam. I ask the kids to each shout out a letter, so we can have two of them to put together, and then play it to Morse Code, and make up our own new rhythms. They almost always all start shouting out different letters at once. I can make a funny big deal out of it, and say, “Wait a minute, not so fast!” Then we pick two letters and play them to the corresponding letters. A dash is a bass note, a dot is a tone. It’s simple, unpredictable, educational, and fun. And they know that you don’t know what it might come out sounding like. So you are building a rapport with them with this activity. What I do is print out a Morse code alphabet, and then go to a copy store, and have them enlarge it to a poster size, and have it laminated. Then I can post it up on the wall so they can all see the letters, and dots and dashes next to them. You can get it done, and have it laminated so it will last you for awhile for under ten bucks. I keep it stored in a round mailing tube for easy transport. I always try to teach a little fundamental knowledge of music when I work with kids, to teach them how to differentiate between long and short notes, and how long they can resonate. I use a triangle with an easy to hold handle. Striking the triangle and then gripping one of its sides will reduce the instrument’s resonance and produce a short note. Striking a triangle while on a string or resting on a finger, allows it to resonate fully, and it will produce a much longer note. It’s good to include that in a first lesson. As I mentioned earlier, a large drum is another excellent instrument for this demonstration. Striking the drumhead using a slap-release technique will yield a long, sustained note due to the head’s resonance. Striking the head with a Slap muffle technique will muffle the sound by reducing the head’s resonance, resulting in a shorter note. I don’t like to show the younger kids the actual slap tone too soon. It’s too easy for them to hurt their hands trying it. I just do it with tones, or bass notes only. After a few moments of this demonstration, ask the kids to stand up and open their arms wide to identify each note you play as long, or to close their hands together to identify the note as short. Once they’ve become comfortable with identifying long and short notes, you can ask the kids to play them on request. It really depends on the age group, as to what ideas I use. When in doubt, drum, then rumble, then drum some more, then rumble. Simple. Volume! This is always a part of my lesson. A great way to teach crescendo (loud) and decrescendo (quiet) sounds is to play this simple game: Demonstrate loud and quiet rhythms, and alternate between them. Ask the kids to listen and lift their arms over their head to show loud rhythms, and to fold their arms over their chests when they hear quiet rhythms. An amusing (and sometimes useful!) variation is to ask them to play loudly or quietly on request. This is a cool drumming interpretation of a game called the phone game, which is great for a group of kids. Have the kids sit in a circle with you, and demonstrate a short drum beat. Ask your neighbor to repeat what you played for them to their neighbor. After the beat goes all around the circle, see how the beat has changed from the original that you played. Try changing the beat only after everyone has mastered the original, and keep the game going by challenging the group to repeat more complex rhythms. It either works, it’s really funny, or it’s a mess. I often use various ideas to demonstrate rhythmic counting. Don’t underestimate the benefits of it. I often incorporate it into my program. It’s the foundation of music. And the kids are learning more basic math in the process, by learning to count off a measure of music. I always start with something in two, or four. Sometimes I divide the group into three sections and demonstrate a simple “Row Row Row Your Boat” style rhythm to one section after another, always turning clockwise. Beginning with me first, I demonstrate it, and invite them to play along. If I sense that there is a sag in the rhythm or reduced energy in the group, this is a good spot for a transition point. It’s also an opportunity to breathe new life into the drum circle by altering the group’s current rhythm. 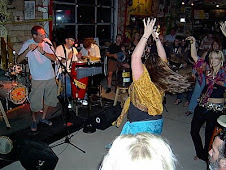 Changing the rhythm of the drum circle will have an immediate impact. Or have them move to different drums. That works to. Closing a kid’s drum circle is pretty easy. When you sense the end, or a transition point and feel that the group doesn’t have the energy or desire to continue, simply get their attention with a big gesture, then increase the volume and tempo to a thundering rumble climax. 4 - 3 - 2 - 1 and stop. An advanced idea is to invite one player at a time to contribute a new solo rhythm of their own creation. I get a rhythm going on my djembe. Get them to actively listen before adding their own rhythm to the mix. Although it may take some time, you will be amazed by the magic that might result. Don’t force them to solo though. Only if they want to try it. Let them use the “safety button” if they are uncomfortable in the spotlight. Believe me, not everyone wants to solo. They may just need more time. Don’t force it on them. I usually use this one on a second or third session with the same group. I go into more information on that that below. You can learn a lot from speaking to music teachers that work with kids all the time. I spoke with this one elementary music teacher who explained to me that she had to learn to get out of the way of the kids so they could have more fun. Too many times, we try to impose our sense of what sounds good, or what we may think is right and what sounds bad, or wrong on the kids. Sometimes they need to be given the opportunity, and/or time to experiment and create without a bunch of rules. The drum circle in class is ideal environment for this reason, and many others. At times, they don’t need us. That needs to be in your head the entire time. Sometimes a teacher will want to run in there and try to get a kid playing who appears to be uninterested. I usually speak with them beforehand about please not doing this. I explain that it’s easier for kids to learn if it’s at their own pace, and when they feel comfortable. They will play eventually on their own when they see how much fun everyone else is having, they’re not going to mess things up, and that self discovery is the way to go. I show them rumbles, volume, tempos, and stops as soon as I can. (Let the kids try doing this if it feels right.) Have them try the weather jam where we simulate Wind, Rain, Hail, Lightning, Thunder. Play storm rhythms on the drums, and percussion. It usually turns into a good rhythm. Sometimes it train wrecks. It lets the kids know we will all go wherever this is going together, and not be afraid of making mistakes. Try the freeze. I Am The Drum. We all play it, and I do some freezes. Let some of them have a try at it, moving around like animals (snake, bunny, elephant, kangaroo, turtle, bird, etc.) and freeze as they are moving or dancing to the beat - Samba, Hip-hop, Funk, whatever. Each kid gets to do an animal sound at the 4th or 8th bar break and etc. I’ve learned that I need to keep it fun, and joke around with the kids a little bit. I need to win them over. Do, or say something silly here and there, between rhythms, or before drum activities. Here’s one idea you can try, make a TV show up like, “American Drumming Idol“. Odds are, they are big fans of the show. You get the kids to find a partner, or groups of 3 & have each team make up a rhythm with words said out loud as they play it. They can perform for the rest of the group. Make a beginning and an end, and they have to make a name for their band. Each group could have dancers also. (The show, “So You Think You Can Dance”) I give them five minutes or so to figure it out. It’s amazing to see what kind of things they come up with. Each team then performs for the rest of the group, (I'm having lots of fun pretending to be a nutty Simon Cowel and giving each group a critique.) I'm also making it into a bit of a competition with the kids voting on whether or not they should go through to the next round etc. It’s a time user, and I rarely use it. Try the “add your voice” drum rhythm idea. It's a simpler drum circle rhythm where you have one person start a groove and each person in a clockwise rotation adds their own unique voice, after a measure or two. I explain to them before we begin that it's preferable to put your voice where no other voices are. Like in between the other drum beats. This gets harder for them as the circle completes of course. When the circle does complete and is grooving all together with different voices it is really cool, if it works. Usually it is such an original sounding composition that kind of slowly rolls around and has many different interesting counter points. (as a result of showing participants how to play in between the normal 1 & 2 & beats by occasionally adding in or using 1 e & a 16th notes - even randomly). They catch on to this pretty quickly. If the groove falters or wanders you can pull the group into a slow quiet rumble, and get on to something else. Another game idea that I use after the group has built a dynamic that seems to be enjoyed by most, if not all the people I work with, (kids, adults, special needs, elderly, etc. could be called fill the gap, or drum break, although I don’t really have a name for it. It goes like this: I explain to the group that we are going to create a drum break for a fill. (That can be part of the rhythm or brought in on a stop.) Often 4 or 8 beats, and that we can take turns to suggest ways to fill the gap, prior to the gap occurring. The suggestions come in the form of body language or a loud voice if the groove is quiet enough. I usually say it out loud. At the given or marked point we all stop playing, (say after eight bars of music) and fill the gap with a fill. For one bar, (a pause) and then you go back to the same beat again for eight bars, and then on to the next person. Fills can be anything, if they want to be brave, and bang their drum a little, great. It can be anything from animal noises, to clapping, to silence, to rumbling, to whistling, singing, screaming, silly gestures, you can suggest a whatever you think will work at the time. Most times, the kids want to do drum riffs, or animal sounds. It’s a fun idea. I feel it’s important NOT to make kids do solos. The best time to experiment with solos is after you have worked with a class a few times. Offer them the “safety button” to use if they are timid. They can push the imaginary safety button when it’s their turn. Be sure to monitor things, or have staff help you, keeping in mind some understood or pre-arranged boundaries may be there. It would look something like this: The group is going along with that simple default rhythm, (1-2----1-2-3) or a Rumba beat groove is what I use the most for this. After the eight bars, we all stop drumming and the kid to my right does an impression of a chicken, or whatever animal sound they want to do real quickly in one bar. Then we swing right back in to the Rumba beat. The kid to their right now gets a turn to make an animal noise, after eight bars, and away it goes, from kid to kid, around the circle. This is always funny, and we are all laughing, waiting to see what funny thing the next kid comes up with. Once you have worked with them a few times, maybe have them try it with a drum instead. It builds self confidence. Although this idea is mostly a good laugh, this is a great way to keep the group grooving while not thinking too hard about what they are playing and it can also create some surprisingly beautiful moments especially if you open it up to the whole group. It never fails to lighten the mood if done with energy. I like Middle Eastern rhythms for this one. Or the Heartbeat rhythm. The Drum Break Solo. I have mixed feelings on it, but when I think it feels right, I like to do this: The whole group is playing a simple rhythm reasonably tight and then we all stop drumming for a drum break, and have one person do a solo. You can demonstrate that the solo doesn’t have to be rhythmic, or complicated, or accurate. We just want them to have fun the way adults do. Hit the drum, rumble, be silly, be intense, be whatever, and you can get everyone cheering for each soloist. But it also puts kids a little bit on the spot, and puts some pressure on them. Sometimes, that’s just what they need. I always put that safety button in there as an option. (I don’t want to force the kids, or even adults, to do it.) I don’t like for people to feel pressured into doing a solo. Some people don’t want to be put on the spot. But it is an idea, I’ve used it, and sometimes, the kids tend to like it more than the adults do! If you try it, I think the best thing to do is give them a verbal 4-3-2-1 countdown before it’s their turn to try the solo. I also keep the beat going, and do a verbal count of going aloud, or by tapping my foot on a tambourine in an obvious way, as each soloist takes their turn, so nobody gets lost, and everyone else is exactly sure when to come back in. And the soloist knows much easier how long to do their solo. So, to sum up, we play for four to eight measures of music, then the soloist does a two measure solo, and then back to the support rhythm. Eight more measures of rhythm, and the next person to their right does a solo for two bars, back to the groove, etc. Send it all the way around the circle. Everybody gets to do a drum break, then go back to the support rhythm. The “Stormy Weather Jam”. Think of it like a slow approaching rain storm. It starts with hands rubbing together, finger snapping, and then body slapping, (not each other). Each is one done incrementally double times but not to any specific rhythm. Then it layers out. (hopefully) It sounds just like a rain storm coming in, letting loose and coming. Make it into a story, then turn it into a beat on the drums. This is a variation of it, and it’s always fun. Here’s a way to do it: I like to simulate the wind by rubbing the hands across the drum head in a circular motion. I use those African seed shakers to simulate the leaves on the trees fluttering in the wind. The pitter patter of a few raindrops by tapping fingertips on the drum, or side of the drum. Then it rains harder and steadier. A storm is coming. Louder tapping. Then maybe some light hail. Knuckles knocking the drum head. Then some lightning, (a little bit louder tones). Finally the thunder beat of a storm! (insert rhythm here) You can make it into a rain dance beat or something. Those thunder tubes work really great on this one. It sounds like real distant thunder rolling in. All the kids want to play the thunder tube once, so what I usually do is let them each take a turn for a minute or two as it’s passed around the circle. Everybody gets to be the thunder drum kid. Try the name game. I say my name, and then I play the beat to the syllables. Take it all the way around the circle with each kid. If it turns in to a sustainable beat, go with it. Don’t force the timid ones. I like to have lots of games and activities and keep things moving. If a groove develops, go with it, and forget the rhythm games. My experience with all ages is kids really want to just play drum beats, not drumming or rhythm games. Especially the older teens, or if I work with the same group more than once. If you want to start a kid’s drum circle, or getting a drumming program going. Well, beginning is easy. In the case of kids drum circle I think a trained facilitator is probably a good idea for getting one started, or seeing if they even like it. Bear in mind, there are as many different ways to facilitate a drum circle as there are to paint art. Have your staff or music director watch them closely and learn. No telling how long it might take. It could be just a few times maybe it‘s four, it might not work at all. Drumming is not for everybody. The odds are that it will be effective. It might be just what they needed to let out aggression or frustration with out focusing it directly at anyone so they can learn faster, and become better students. Sometimes I use different drumming ideas, activities, drum games, and programs. Other times I just get them playing on a drum as quickly as I possibly can. My goal is usually always the same, to get them playing the drums as fast as possible. I have three or four beginnings in mind for a new group. I don’t know what I’m going to do until I can size them up, and feel the group dynamic. I don’t want to force them into something they don’t find fun! If something falls flat, just move quickly to something else. Mostly, I start with the egg shakers dance or just playing the drums. The warm up jam sets the mood. Good luck with it, and keep it fun! Remember to try and speak with the staff afterwards for feedback. And at the next time you are there. (Hopefully) Or, leave them a feedback form to fill out, with a self addressed envelope and a stamp on it. I've gathered a lot of useful information with a simple feedback form. Remember that there are restrictions on photography in most cases, so be sure to ask if you want to take photos. If it's an event out in public, with the general public invited - then it's different. If the group needs to take a break for drinks or snacks, make sure they don’t come back to the drumming area before they are all finished. Goatskin drum heads still make terrible tables and coasters. One thing some don't understand about drum circles, is that it's more about the people, than it is the drumming. Many facilitators agree with me on this, some don't. The quality of the music produced in a drum circle isn't really based on the musical experience of the players, but on the developing quality of the relationships of the people that emerge. As a facilitator I help people to empower themselves through drumming, music, and fun. They need no experience at all to play in a drum circle. I encourage individual creativity, and group dynamics. Ultimately, I just want to let people play. We drum up some fun. Let your personality out, and with your calm and reassuring manner, watch the volume, and they will quickly enjoy playing together, and connecting with you. I hope some of this is helpful to you, and it gives you a few ideas working with kids individually and in groups, young or teens. Please keep in mind that these are just my opinions, and based on my experiences. If you would like to read some more about my approach to drum circles, please consider picking up my book, “A Practical Guide To Hand Drumming And Drum Circles” It’s 300 pages, and $8 on Amazon Kindle or Nook. Physical copies are sold out. If you choose to purchase it, my 101 drum circle rhythms video, or drum circle jam CDs - mp3s - thanks in advance for helping an independent musician. The proceeds help me with drum repairs, and doing work in our community. It helps out the most, if you purchase direct from me at my website. There is increasing recognition of the health benefits of music therapy, particularly facilitated hand drumming, which is what I do for a living. Unfortunately, places where the people who benefit the most, such as senior centers and special needs can not afford to pay for this. If you're a filmmaker or video / TV producer all of my drumming & drum circle music tracks are licensed. Check CDBaby.com & listen to a few. There's a wide variety of cultures, styles, and tempos to choose from. Helps to set that perfect mood for a scene. Check out the drumcircles.net home page with my 2 hour DVD of 101 Drum Circle Rhythms. A free 75 minute drum circle jam CD is included. Both discs are $10 + $3 shipping. Please visit the main page for a video sample, and more information. And while you're at it, check out my drum circle finder at my website drumcircles.net where you can locate drum circles near you in your state. There are over 1000 listed and still growing. Also a global drum circle list. These listings are updated regularly. It’s a human edited database since 1999. Check out the FaceBook page also, “Drum Circle Finder”. The proceeds help to offset the website costs. Please help support it a little if you can by picking up a few drum circle music mp3s at most online retailers.